Build slot confirmed for week 28! The long wait begins. The wait is painful lol. 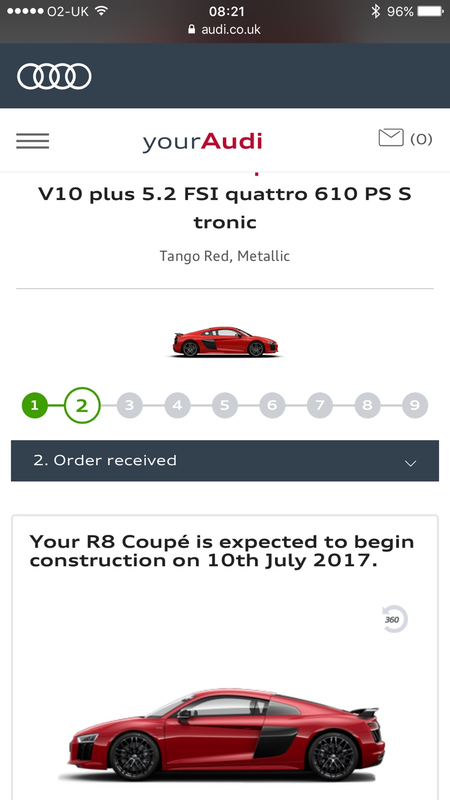 When I ordered my RS6 performance the 7 month wait seemed like an eternity. But when the day arrives -well worth the wait! However, then I waited until I had done about 1k miles before thrashing it!! Current: 2012 RS3 APR St2 exclusive buckets! 2014 C7, Misano c6 mrc stage 2. AAS Custom Exhaust, cat bypass, itg filters. 731ps 1058nm. Superrbike quick! many, many cars; all great and well-remembered! wrekka wrote: Looking good fella! Thanks Wrekka. I know, long and painful. On a good note the build date has come forward to June 19th! Hopefully it'll come forward again.